Fully Monel 400 ball valves, Class 900, RF, body & trim: Monel 400, trunnion mounted. Monel valves refer to industrial valves made from Monel alloys which are nickel-copper based corrosion resistant solid solution alloys. The copper added can improve the corrosion resistance and strength of the nickel alloy. In valve industry, Monel alloys are generally classified as wrought Monel alloy and cast Monel alloy. The wrought Monel alloys include Monel 400(UNS N04400), Monel C, Monel 403, Monel 404(UNS N04404), Monel R-405(UNS N04405), Monel 406, Monel 411, Monel K-500(UNS N05500), Monel 501, Monel 502(UNS N05502) of which Monel 400 and Monel K-500 are most commonly seen in the valve fabrication. The cast Monel alloys includes ASTM A494 M35-1, M35-2, M-30H, M-25S, M-30C, and QQ N-288 Grade A, B, C, D, E.
Types: Monel ball valve, Monel gate valve, Monel check valve, Monel globe valve, Monel butterfly valves. Pressure Ratings: Class 150~Class 2500, PN 16 ~ PN 100. Operation Method: lever, worm gear, pneumatic, electric actuator. Seating: metal or soft seated. Port: full port or reduced port. End Connection: flanged(RF, RTJ), SW, NPT, BW. Standards: ASME, API, EN, ISO, BS, DIN, JIS, etc. Generally Monel valves can be used in applications involving hydrofluoric acid, brine, sea water, alkaline solution, reducing acids, dry chlorine and hydrogen chloride gas at high temperatures. 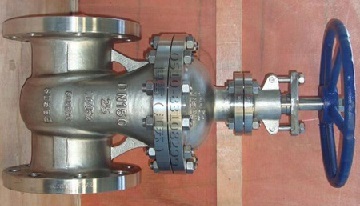 A PN16 gate valve, DN 200, body: CF8M(SS 316), trim: Monel K-500. Especially, a fully Monel valve refers to both the body and trims(internal parts) of the valve are made of Monel alloys. It is widely used for the alkylation device of the hydrofluoric acid(HF) regeneration column in an oil refinery. Considering the high temperature and high moisture contained, fully Monel valves shall be utilized. Besides, this type of valve can also be used in high-concentration chlor alkaline solution systems. 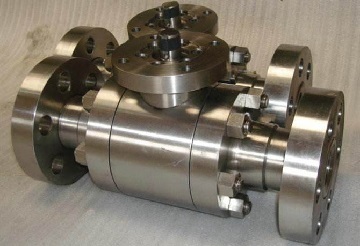 Another type is valves with CS/SS body and Monel trims: in the low-temperature section of a HF acid system, since the carbon steel can withstand anhydrous HF acid at temperatures below 71°C, it is widely selected as the valve body material. However, the valve trim materials shall be Monel alloys to meet the corrosion and erosion resistance requirement within the body cavity. In applications involving ethylene, propylene, liquid oxygen, pure oxygen, and seawater, usually, valves with SS body and Monel trims are chosen. The combination of CS/SS and Monel in valve manufacture may significantly reduce the production cost.